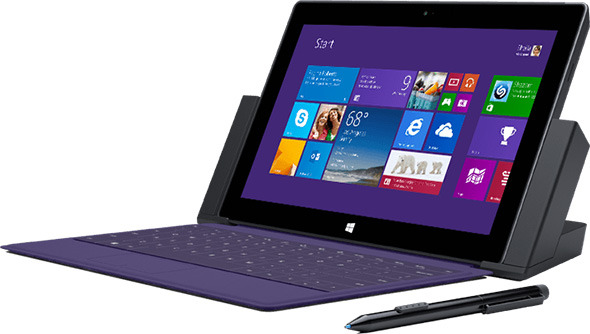 Microsoft Surface Pro 3 Review: Should It Replace Your Laptop? Microsoft Surface Pro 3 Review: Can It Replace Your Laptop? Microsoft is on the spree of launching new things replacing the old. 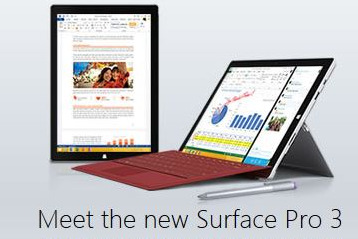 The Surface has been there for quite a long time, but the Pro 3 model has really wooed the market. It has replaced many devices with its latest hybrid technology bringing together the best of laptop and tablet attributes. The multi flexible angle added more feathers to its crown. So just check out whether you would also be on the move to replace your current device with a Surface Pro 3. You must be hearing the rumor around that Microsoft is all set to replace your laptop with its latest tablet, Surface Pro 3. But how far that can shake you up depends on the kind of difference it makes, and of course it has to do something drastically positive from what you are already enjoying. A replacement can only take place if the buyers are in a fix of choosing between two best products among which there are contradictory benefits, and the replacement can bring the best of two. The Surface Pro 3 is claiming to be a hybrid with the talent of many devices owning which you need not carry all of them together. It can be defined as a combination of 'a complete PC, a graphics tablet and a digital notepad'. It is a 12-inch device, with a 2,160 x 1,440 screen; weighing around 800 grams. 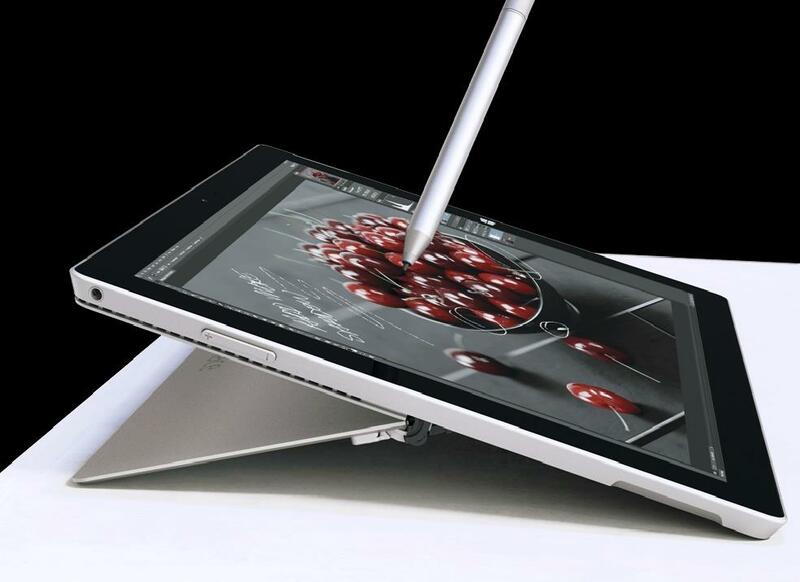 It works on Intel Core i processors consisting of a 64GB to 512GB storage; and comes with a Surface Pen. 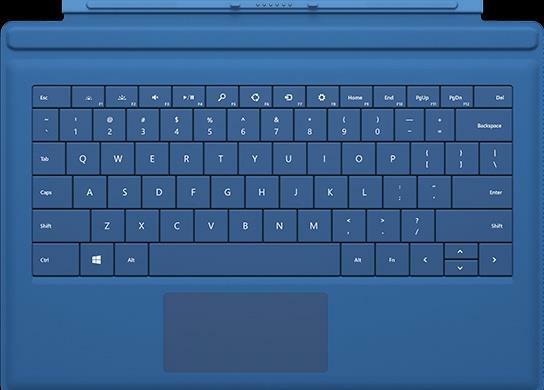 The Surface Pro 3 comes with Windows 8.1 with an option to free upgrade to Windows 10. It has 2GB of RAM with 3.5MP front-facing camera, a 8MP rear-facing camera ad you get a one year subscription to Office 365. If you have experience with Microsoft's earlier version, Surface 3, then things doesn't seem to be too different. The concept is more or less the same with a built-in kickstand, a keyboard cover and a pressure sensitive stylus. The other Surface Pros were appearing to be either inconveniently small or big for either as a tablet or a laptop, but the Pro 3 has just the right size. The Surface Pro 3 is also thinner and lighter than its earlier versions. With a weight of 800g barring the keyboard, it might appear to be a bit heavier than the usual tablets, but it is definitely lighter than any laptop that falls under this category. The thickness is just 9.1mm. That is even thinner than the pre-iPad Air retina iPads and it has got every component packed in it which a proper PC should have. That is a real surprise. Talking about its body, it has that textured metal rear, with chiselled edges, got a pair of discreet air vents, and all these speaks loudly that Surface Pro 3 has no compromise in quality. The new kickstand is another great proof of the build quality. 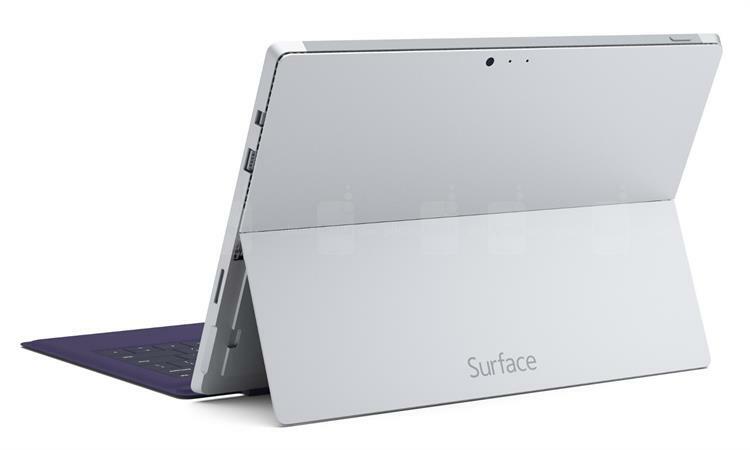 After a single and then a dual, the Surface Pro 3 can now be set to any angle, say between the upright position and almost as flat. It doesn't end there. The hinges are equally sturdy and smooth. So, you can work with it at whichever angle you find it comfortable. This extra flat angle fits ideally for small tables by laying it flat down and type on the on-screen keyboard. But the only caveat which appears here is the size might not seem to be enough lap-friendly. That can refrain you from switching your laptop to the Pro 3 model. The device has picked up a good speed because of the Intel Atom quad-core processor and 2GB of RAM. The interface is quite apt for zipping around and also for switching between the applications. Even with a little more pressure, like Photoshop, or Corel Draw, the Surface does maintain its worth. Sometimes you might have to face a bit of delay while transferring video files from the preview pane to the place you are working, but it wasn't that irritating. It is better not to expect the device Surface Pro 3 to play high intensity games on the though, as the integrated Intel graphics isn't the one for it. The display with 1080p IPS is quite bright and because of its great viewing angles, one really won't need to hold it for even a while in any awkward angle to see the right texture and shades of colors. Even if you are working on power saving mode with lesser brightness, the display looks equally impressive. The performance is slightly gloomy on a bright sunny day, but it does not get any help from the reflective, glossy ISP panel. You will have to try several angles to see it properly if you are working outdoors, but that where the flexible angles come to rescue. Excellent built with a stunning bright screen. A wonderful hybrid with the best of laptop and tablet attributes, a perfectly working digital pen and outstanding design and display. The battery life is not as good as expected. At times the system turns hot after a longer usage. Doesn't have a full-size SD card slot which was quite shocking. For some it might not feel good and cozy on the lap. The other mismatch is that there is absolutely no way you can attach the pen with the tablet. Yes you can say that the clip on the top of the pen can be used. But that is the only thing that can clip the pen on with the keyboard, but even that needs a bit of push force. That really feels awkward that a major accessory has nothing to stay connected with the main device, and that too for a pen which is so likely to be lost. A device cannot be entirely flawless. Rather that gives out a scope for further improvement. Microsoft Surface Pro 3 isn't an exception to this, but yet the positive changes it has brought in doesn't have much of a scope for competition at this moment. The large touchscreen and the stylus work perfectly and is really appreciable. The overall gamut and performance does make one feel greedy to upgrade. The angle flexibility too makes it dynamic in nature. But before going for a straight purchase it could be a good idea to wait for a better upgrade from the Microsoft. With the launch of Windows 10 it is more likely that Microsoft might wish to upgrade it to a better version incorporating those corrective measures. But that doesn't make any point of waiting if you were already on the go for a new device and have turned hypnotic towards the Surface Pro 3.